How Many Places Do I Have To Be Published Before I Can Claim To Be A Writer? So… I think I accidentally became a writer. I don’t know exactly how it happened. Boredom? Experimentation? Florian was sick of hearing me ramble out loud? 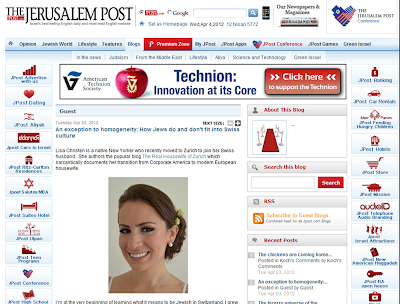 I started with my blog just to keep friends and family updated on my new crazy life in Switz and all of a sudden I’m writing serious stuff for The Jerusalem Post? How’d that happen?!? Obv I have a variety of things I write about, partially because I likely have adult ADHD and partially because I’m exploring the age-old question “what do I want to do with the rest of my life.” In case you haven’t noticed by my weirdly diverse blog entries, some days I think I’m going to save the world and some days all I can think about is what a disaster I am in the kitchen. And some days I don’t get off the couch for 14 hours (only when I’m catching up on 4 seasons of Mad Men!). International Writing: People always ask what’s different about Switzerland and America. I could talk for hours and hours and hours about it (and you can be sure future blogs will continue to make fun of the ridiculous ways I figure these differences out), but one of the biggest I felt when I moved was that if you’re different from the Swiss, they don’t exactly… like it (I’m being polite here, please use your imagination to read between the lines). My guest blog post was featured here for The Jerusalem Post about how Jews do and don’t fit into Swiss culture, but honestly it’s about any different culture fitting in, in Switz (ie, Muslims receive the same unwelcome feeling the Jews do. Hey, I guess I finally found the cause to unite Jews + Muslims!). 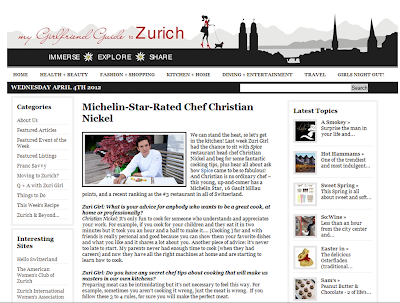 Local Zurich Writing: My interview with an awesome chef in Zurich was posted here on My Girlfriend Guide, a local online mag in Zurich. I had eaten at this amazing restaurant for my birthday dinner and immediately thought that other people needed to know about the place. I mean, it was and still remains the best meal I’ve had in Switzerland! So, I asked the waiter if I could please speak with the chef (which caused some confusion because “chef” in German means “boss” and they sent out the owner. Oops!). Oh well, I told the owner that I wanted to do the interview and it was really just that easy to get a Michelin-star-rated chef to tell me all of his cooking secrets. And since I’m nice, I’m sharing them all with you in that article. A Super-Secret New Adventure: Ok, I’ll admit it just to you guys and it will be our little secret. I feel a bit like an egomaniac when I constantly just write about myself all the time so I was trying to think up something else to write about that could be a little bit more… important to the world. I had an idea that nobody else is doing and I started writing some sample material, so stay tuned and maybe, just maybe, I’ll be telling you all about my super-secret-awesome-for-the-world website very soon!